Pass your B1 English test with us! We provide B1 English Test Training to help you pass your exam with a 99% Pass Rate and FREE RETRAINING if your fail your exam. Pick your training class or contact our offices on 01158376502 to speak to a teacher, If you cannot find the information you need please contact us and we will support you as best we can! We have a 99% pass rate and we prepare you fully before we book your test! The Home Office requires you to pass this test and the Life in the UK test for Indefinite Leave to Remain or British Citizenship. Please note we are NOT a Trinity approved test centre. We only support you in booking your test to your closest SELT centre and training you to pass. Classroom and online classes ideal for students who want to pass their B1 English Exam. Our UK teachers will coach you to test through interactive lessons. Online classes are popular with students who don't have time to attend classrooms or complete courses due to other commitments. PLEASE NOTE: As proof of ID you can either use a passport, biometric residence card or a european residence card or a legal travel document. Without one of these original documents we cannot book your test. You must book your test in one of the SELTs approved centres. Exam dates are up to 7 days a week, across 9 UK cities: Belfast, Birmingham, Cardiff, Glasgow, Leeds, London Hammersmith, London Holborn, Manchester, Newcastle, Peterborough. 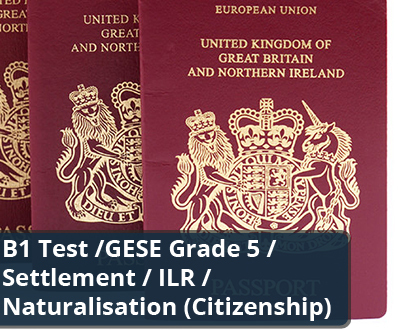 Please ensure to check the Home Office website for more information on whether you are required or exempted from the requirement for B1 test. Call us if you have any questions about ID on 01158376502. Our classroom training is located at 82-84 radford road, Nottingham, Hyson Green, NG7 5FU. We also provide telephone and Skype training for those who cannot reach our classrooms. We have 99% pass rate and after you have passed your test your certificate will arrive to your door within 7 days! Or call 01158376502 to enrol over the telephone. Final Test: A speaking and listening exam which will test the student on grammar, sentences structures and vocabulary. The final cost of the exam is £150 which is paid to the Trinity College London for a SELT approved certificate. We are nationally recognised as leading training providers for the A1/A2, B1 and Life in the UK tests - with multiple years of experience. Really wanted some help for my husband who is from Pakistan. His reading and writing is not very good because he didn’t go to school. I went here and he felt very comfortable with the classes and the teachers are caring and helped him pass. He is now on the life uk class and hopefully will pass soon. Thank you we will definitely recommend you to our family.